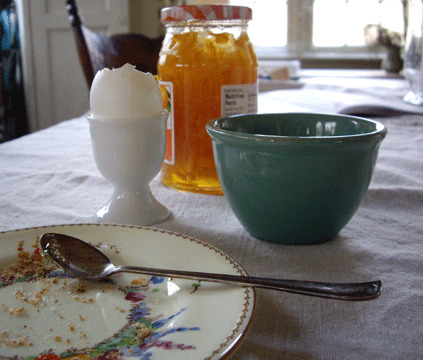 And here are the remnants of my motivated morning breakfast…Around this Easter-y time of year, I always recall the delights of eating a softboiled egg with toast points and marmalade. yum! I would still like to try to make my own Meyer Lemon with Vanilla Bean Marmalade . I wonder if Meyer Lemons are still in the stores around here? I know you only get a short window in which to purchase the yummy little things. Well, I'm off to try to get things done on this pretty golden morning!! Jenn, you were the darkroom assistant remember? You have great photo skills when you put your mind in that place! keep it up! 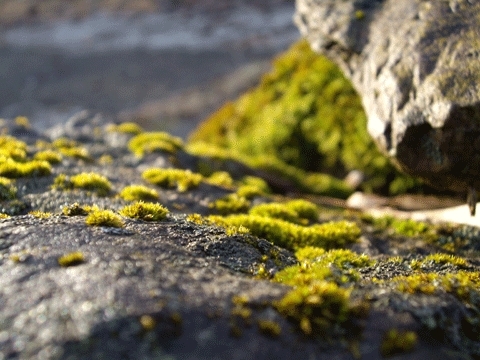 i for one like the moss covered rock and i’ve been meaning to try that breakfast ever since you mentioned it last year. okay and meyer lemons are amazing! I love mornings.. especially sunny mornings.. Ive had a nasty bug for about a week, so I’ve not had a great morning in a bit! I’m so hoping tomorrow is like that for me! love your pics.. especially the breakfast one!